How was my day, you ask? We had some lunch and I started clearing out Darcy's shrine...er, I meant the empty bedroom that would have been her nursery...to start dreaming about Brian's new room (more on that later). I blinked and Miss Carol was here - Gavin's hearing teacher - for her monthly visit. We both agreed that Gavin is a rock star and I unloaded a lot of "old" hearing aid paraphernalia and equipment of his that she could donate to needy families she works with. After she left, with an hour on the clock before Miss Sara left for the day - I quickly ran to Fed Ex to ship a birthday present to a Mr. Sam Burney who's Mommy is a long time reader and friend of this online journey of mine - then the post office to mail a very important letter. I was home in time to say goodbye and THANK YOU to the wonderful Miss Sara (she really is)...put dinner on (corned beef and cabbage)...and say hello to Miss Katja and her boyfriend! Franco was here to give me an estimate on painting the boys' bedrooms (more on that tomorrow) and helping me cover the corners of our walls downstairs with plastic shields from Gavin's walker practice! That was my day - what did you do? I recently told you that he was pulling individual blocks out a bucket in OT...something that we have been working on for years - but has been a serious mission in OT for the past year. And he is doing it. Well, another goal is color matching. It has been his teacher, Miss Janna's, mission for this whole first year. Twice a week she is here - and twice a week she would attempt to get him to color match. I am ashamed to admit there were a few times here and there that I actually (internally) rolled my eyes and thought it was hopeless. ME!! His MOM!! Shameful, I know. But Janna persisted and each week she brought her calm, cool demeanor to therapy. Each week Gavin would gaze at her with stars in his eyes. Little did we know he was taking it all in...because today - he did it. Take a look after grabbing your tissues. He would start off touching the block and it would fall anywhere. But we waited...and saw that each time he would correct himself! He would pick up the block that fell - and sweetly place it in the matching color square. We were all a bit speechless. If you're new to this blog...you'll have to just trust me and all of Gavin's fans. This is big stuff. And if that weren't enough to upstage anything that you or I did today - he was also a rock star in his walker! I know that doesn't seem like "new news"...but it is! You see, I un-attached the sling seat that was holding him from falling to the ground. The sling seat gave him some extra security. It kept him "halfway" in the walker instead of on the ground if he got tired - which meant he only had "halfway" to pull himself back up to keep on truckin'! 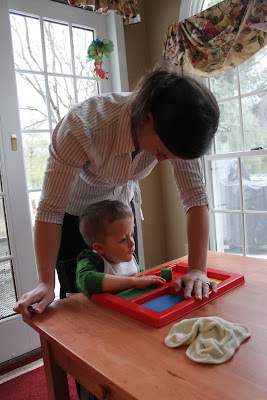 So we unhooked the sling seat yesterday and today - and he is doing SO GREAT!!! 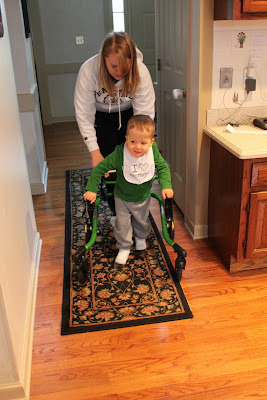 Each day he is improving in this walker. And, as Miss Sara says, one day he's going to just walk right out of it and show us all. That Miss Sara is pretty smart. So, like I said...whatever anyone else did today is small potatoes. No hard feelings, right? Yay! Way to go Brian and Gavin. Such big milestones. Getting Seb's first piece of artwork from preschool was huge for me too. So awesome to see Gavin cruising.in his walker and matching colors!